SSC CPO Previous Year Questions Papers. As we all know recently, the Selection Staff Commission (SSC) has released SSC CPO Recruitment Notification 2018. This year commission has announced 1223 vacancies in the various department for the post of SI (Sub Inspector)/ASI in Delhi Police/CAPF /CISF department in the Central Police Organization (CPO). 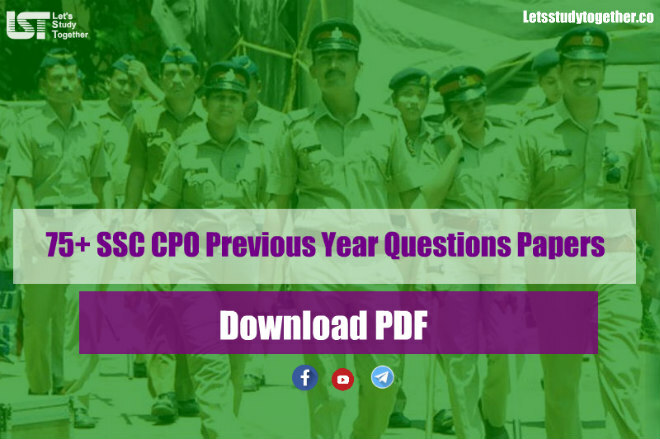 Here we’re providing SSC CPO previous year paper PDF with answer key in Hindi & English. You can download the SSC CPO previous year Questions paper PDF and practice the questions asked in SSC CPO SI Exam. This year, SSC CPO SI Exam 2018 Tier 1 exam is going to be conducted from 4th June 2018 to 10th June 2018. Hope you will find this article useful. In case you have any doubts or queries then let us know in the comment section and also mail us at support@letsstudytogether.co . SSC CPO SI Delhi Police Recruitment 2018: Exam Dates, Notification.